Ok, enough theatrics. Let's get down to bidness. The question at hand was, "what the hell do I do with old pillows and down comforters?" Or something like that. The charities that she had contacted don't accept said items. I suspect they probably heard about the headlice outbreak at our school (again! what's with these kids?) and know better. She didn't want to throw them out and she said she didn't have the gumption for repurposing the items into something crafty, so I told her I'd do some crunchy recon and see what's what. Fortunately, there are a number of options. The Salvation Army accepts pillow donations and blankets or comforters in some areas. Many homeless shelters will accept donations of pillows and blankets. If you can't find any in your area that accept these donations then check with the local animal shelters. If they don't accept bed pillows, but they do accept dog beds, see below. You can also try Freecycle or Craigslist. You never know what use someone else can put them to and you might just make some money out of the deal. If none of those options work and the pillow or blanket is made out of down, you can compost the feathers. For those crafty types, some pillows have innards you can wash and re-stuff. You can even wash the feathers and use them as stuffing for a number of projects. If your local animal shelter accepts dog beds, there are a number of different ways you can use the filling to make your own dog bed for donation. Very cool. My pillows are getting so worn down they're causing some back problems...so I went to Target and bought a "bamboo" pillow. The tag said it was cotton and polyester. Hmm. Any ideas/guidelines for buying NEW green pillows? Feathers, when really worn out, or too dirty - are a fabulous of slow-release nitrogen for your garden. They're almost pure protein, but it's the fingernails and hair type; very slow to break down. You can either till them in (so they don't just blow away) or bury them in your compost heap. You can use the goose down to fill something else: make pillows, another comforter, a nice warm coat, etc. But be sure the fabric you buy is a very tight weave so the feathers are less likely to escape. I tend to pair up old flat pillows in one pillow case. It makes for a Very firm pillow but those can be useful too. those are great tips. i know our local animal shelter has just expanded and is in need of bedding materials. perhaps i can do some de-cluttering and philanthropy this weekend. 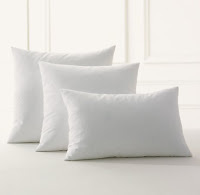 We just replaced all the pillows in our house after a rather nasty round of flu. Isn't it amazing how the wee ones know just how to barf where it is hardest to clean? After washing them all 2x they became really lumpy. My plan is to make soft sculpture dolls with my 4 year old. It is a great way to use up the stuffing, old nylons, and any other little odd ball yarn or buttons. I'm surprised there would be any trouble donating the blankets. The shelters here will take the blankets if you wash them in a hot cycle or dry clean them. The pillows are hard to donate because of a fear of head lice and bed bugs- which are making a comeback here. An animal shelter is a great suggestion. Not quite sure how to recycle the critters. I'm sure you can think of something, Crunchy. blankets - if the local homeless shelter won't take them - Definately send to the animal shelter - the one near me takes old bath towels too. Pillows....thats a toughie. My mom made the kids pillows with shredded foam - you can get a big bag for under $4 at Joanns. Its enough to do 2 bed pillows. She got fancy - When I did them for me I didn't. I just put the shredded foam in an old pillow case and sewed it shut - then put it into a quilted pillow case cover and put a regular pillow case on for sleeping. Its nice because its just the right amount of stuffing and I toss it in the wash when I do the sheets - and into the dryer too. Great post! It's just another one of those things people don't really think to recycle. I know our vet takes old bedding too -- for animals who board there or need an overnight stay to recover. Instead of buying a bed for our dog, I gave him our old comforter all folded up and gave him a couple of old pillows. I have to "make his bed" every couple of days to refold the comforter, etc, but he absolutely loves it. If headlice are a concern, all you have to do is put the pillows etc. in a garbage bag (or just away from people somewhere) for a few weeks and presto no more lice issues. Lice live for almost no time at all off people and the eggs need the heat of your scalp to hatch. They aren't like flea eggs that can hibernate for a long time. Yeah! I've got 2 or 3 old pillows sitting in my basement. I couldn't bring myself to throw them out. I'm going to call my local animal shelter. Thanks for the tip!